Thou shalt not sticketh thy fingers into thy mouth and play with thy gum whilst thou art talking to thy friend about thy crush on this boy that thy friend Amanda went out with last year but they broke up because he had soccer practice so he couldn't take her to go see 'Made of Honor' and besides he said he thought it looked stupid but it was such a good movie and really really cute and OMG Patrick Dempsey is so adorable and don't you think Nick in biology class kind of looks like him? but anyway he got kicked off the soccer team because his mom was a total witch-with-a-B to the coach and Julie said that Brian said that Kam said that he was quoting 'She's the Man' at Tyson's birthday party and that's your all-time favorite movie so you two are obviouslymadeforeachother. What is the beekeeping pirate's favorite place to eat? Arrrrrbees! A guy walked into a bar and said, "Ouch!" What's black and white and black and white and black and white and black and white? A nun falling down the stairs. What did Batman say to Robin before they got in the car? Robin, get in the car. What did the fish say when it ran into the cement wall? "Damn!" What did the wall say back? "DumBass." Where does the general keep his armies? In his sleevies. What do you call a parrot wearing a raincoat? Polly Unsaturated. Why does a chicken coop only have two doors? Because if it had four doors, it would be a sedan. A grasshopper walked into a bar. The bartender said, "Hey, we have a drink named after you." The grasshopper said, "You have a drink named Bob?" Why did the monkeys refuse to join in the jungle poker match? There were too many cheetahs. My dog Minton ate two shuttlecocks yesterday. Bad Minton. Sorry, ryanmer, but any time I have to use Wikipedia to help me understand a joke, it's officially not funny. Thanks to @BeautiCreams, @scottspjut, @ryanmer, @BigBags and @txnewsprincess for their contributions. Feel free to leave more in the comments! ... wearing your baseball cap sideways while saying words like "yo", "home dawg", and "shizzle." Today is the six-month anniversary of the start of this blog. I just thought you'd like to know. Also, Satan lost one of the Hell Hounds, so if you live in Cleveland, keep an eye out. Those things tend to gravitate toward Cleveland, for some reason. Oh, so just because it's ugly (I don't think it is, by the way), does that give her the right to throw it out? It's just something I throw on when I'm hanging around the house, or working in the garage, or playing basketball with Pete. Okay, so maybe I've worn it to work once or twice when I'd forgotten to pick up my robe from the dry cleaners. Big deal. You know when you have one of those shirts that just fits so perfectly, and you've washed it so many times it's soft like butter, and wearing it just puts you in a better mood? That's what this shirt was to me. And I don't understand how the Missus thought it was so ugly. She never liked it, ever since the day I brought it home. 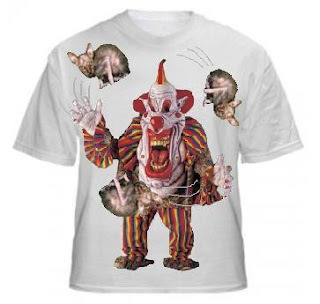 I ask you, what's wrong with a picture of a happy little clown juggling some kittens, huh? Come on! What's so 'hideous' about that? Hello! My Name Is Inigo Montoya. You Killed My Father. Prepare To Die. I'm imaginative. I think outside the box. Unfortunately, because I'm so busy, I don't have a lot of time to pursue my creative hobbies. It would be so... well, Heavenly (for lack of a better term) if I could have more time to work on my songwriting or stand-up comedy or stand-up songwriting comedy. Last night it was the Missus' turn to pick the movie for our traditional Wednesday Watinée (I came up with that. Told you I'm creative). She picked The Princess Bride. Great movie. One of my favorites. Remember the part where Andre the Giant said, "Anybody got a peanut?" Classic! As we were watching it, I got to thinking. Maybe I could pull a Dread Pirate Roberts. I could find somebody to replace me, pull a little switcharoo, and retire. Because, like Westley says in the movie, it's the name that really matters. Oh, retirement! It's a tempting thought. I'd have so much free time to perfect my stand-up songwriting comedy that I bet I could even be better than FotC. Or maybe... maybe I'd write movies. I do love movies. I have this great idea for a script, actually. Yesterday's Watinée inspired me. It's kind of like The Princess Bride meets Terminator meets Goonies, set to the music of Sonic Youth. I think it could be a big hit. Okay, guys, come on. Let's use our prayers wisely. Before you waste both your (and infinitely more importantly) MY time with a silly prayer, take a moment to think about what it's really supposed to be for. Please, pray to me about big life decisions. Pray to me when you're sick, or when you're worried, or when you're feeling especially happy and grateful about something. Pray for help finding your keys so you won't be late. Pray before taking a big exam or to calm your nerves before a presentation at work. I don't even mind if you pray that your favorite bakery hasn't run out of Cinnamon Swirl cupcakes because you've had a crappy day and want one really bad. But seriously, stop praying for magic powers, you nerds. I'm not going to make you invisible. I'm not going to make you fly. I'm not going to give you the ability to communicate with animals. What do I look like, a giant vat of radioactive goo? 6:45 - Ignored alarm clock. 6:46 - Ignored the Missus poking me and telling me to get up. 8:52 - Finally ate that banana like the Missus wanted - with ice cream and hot fudge! Thou shalt not use a fine-tip Sharpie to play 'connect the dots' with thy young nephew's face freckles and then tell his mother that he didst it to himself. ... duct taping your friend to bus. Everyone wants to know what Heaven is really like, and it seems like everybody has a different idea of what would truly be 'heavenly'. To some of you, Heaven couldn't be nicer than lying back with a loved one in your arms, listening to the rain hit the roof. Some imagine a beautiful place made of clouds and rainbows and sparkling sunlight. Others are really hoping that we have a kickass waterslide. But, you know, it really is possible to have a little piece of Heaven on Earth. Especially right now, when the world seems to be in such turmoil, it's wonderful to be able to find your own little peaceful corner of Heaven, no matter where you are or what you're doing. Hahahaha! Seriously? I can't believe you just closed them. This is a blog. How are you supposed to read what to do next if your eyes are closed? GOTCHA! Thou shalt not thump a monkey. Heyyyy. Sorry it took me so long to get back to you. You just caught me at a really bad time. I was really busy during the 70s, and I swear to Me I had every intention of getting in touch with you during the 80s, but it just turned into one of those things that I kept putting off and it get put on the back burner. My bad. So I was looking over all those questions you asked me, and it seems you've pretty much found most of the answers for yourself over the past forty years. You've done pretty well without me, actually. Except for the seventy pounds you've put on since the second divorce, that is. I wish I had more time on my hands to personally connect with all my children. Back in the early days, I hung out with Adam all the time! We'd take walks, see all the animals, have a catch, and I'd even have time to impart some kind of important lesson before bedtime. But now there are just so many of my children wandering around on the Earth, seeking me and my wisdom and guidance; it's impossible for me to give them any quality time! Remember that scene in Horton Hears a Who where the Mayor had so many kids he could only schedule one minute of quality time for each of them as they whisked by him on a conveyer belt thing? Imagine that times 704 million. I'm starting to regret that whole "multiply and replenish" commandment, because OMMe! Seven billion people? That's just ridiculous. Do you have any idea what that means? That means, if I had nothing to do all day but devote my full attention to my children, they would each get 12/millionths of a second a day. Now, I can do a lot with 12/millionths of a second. The problem is you. Not you, specifically, Margaret, but everyone just like you. If you guys would just pay attention when you're praying, instead of just rambling on about nothing, maybe you'd realize that I'm trying to answer you but can't get a word in edgewise. So to answer your question, Margaret: Yes, I'm here. And I've set aside a whole three minutes just for you, to talk about anything you want. Anything at all. What's on your mind? Would you look at that! We're out of time! I must have taken so much time talking about having no time that I now have no time. Shucks. I really wanted to help you out with that, I did. We'll talk about it later, I promise. ... breaking wind in an elevator. Moses showed up to work on Friday wearing a Hawaiian-print robe. He said he thought it'd be fun if we had "Hawaiian Robe Friday" once a month. You know what I decided would be fun? Telling everybody else in the office that today was "Leave a Random Item in Moses' Cubicle Monday" and watching his head turn purple and quiver with anger when at the end of the day nobody claimed the Lituanian flag or pet rock. Thou shalt not drinketh directly from the orange juice carton until there is but sixteen and a half drops left, then return the carton to the refrigerator so that the next person who wants some juice realizes how little there is in the carton and decideth to not dirty a glass for a mere sixteen and a half drops of orange juice, but drinketh straight from the carton as well and catcheth thy swine flu as a result.